Again, I must bend the (as yet unwritten) rules to induct a TV character rather than a movie character. But again, I believe my nominee is (wait for it…) justified. We Tweederati are divided on the topic of FX’s crime drama Justified. Lloyd was impressed at first, but was vexed to abandonment by the apparent reliance on hateful stereotypes of Appalachia. 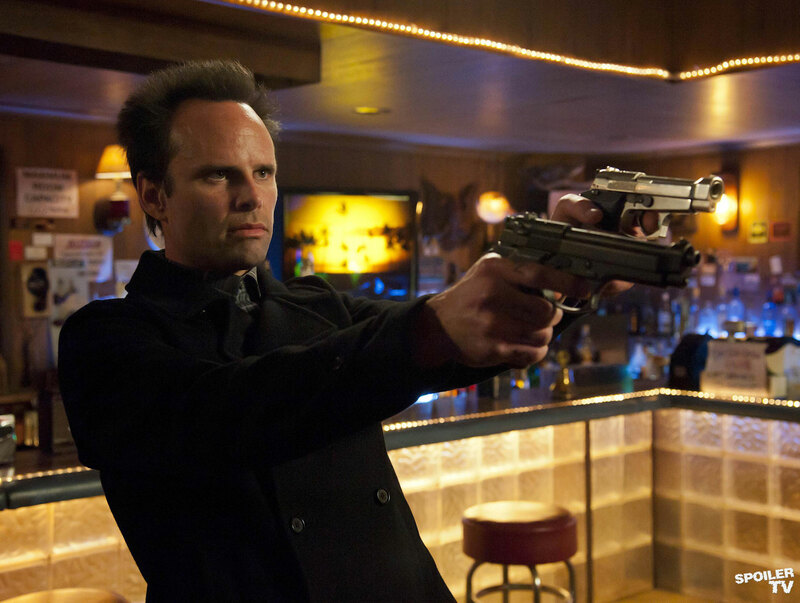 As I’ve said before, I do not deny these stereotypes were abused in the show’s early episodes, but having stuck with Justified through its three seasons (so far) I have come to love its performances, dialogue, double- and triple-crosses, and otherwise exciting good-guy/bad-guy drama. While the show, based on Elmore Leonard’s short story “Fire in the Hole,” is ostensibly about Deputy U.S. Marshal Raylan Givens, it is his childhood friend and sometime-nemesis Boyd Crowder who steals the spotlight. When Boyd, the youngest and cleverest of the Crowder clan of Harlan County, Kentucky, is introduced to the audience it is in the form of a neo-Nazi, redneck thug with daddy issues and a penchant for blowing up black churches with bazookas. After a stint in prison, Boyd emerges reinvented. He renounces racism, finds religion, and compels a group of ex-con true-believers to wreak havoc upon the Eastern Kentucky pill and methamphetamine trade. I asked him to shut down his poison factory and merely made an observation about its combustibility. In the show’s second season Boyd again reinvents himself (or, as he claims, self-realizes) as a mob boss of sorts, engaging in a selection of criminal enterprises particular to the Eastern Kentucky region. He settles in with his brother’s widow (and ex-lover of Givens), Ava, and a team of thugs that includes Givens’ own father. By season three, Boyd’s enterprise is in full swing but he finds himself having to fight off Givens’ perpetual suspicion as well as competition in the form of a rival family and a slick, sick, and resourceful interloper from the Detroit mob. Walton Goggins, whose performance was nominated for an Emmy, also did very well as “Stans” the orange-jumpsuited convict in 2010’s Predators and he has a role in Tarantino’s upcoming Django Unchained. He plays Boyd Crowder cool and collected. This guy is smooth and deadly and always manages to get away in the end. He’s a criminal to be sure, but the audience gleefully roots for him and hopes his enemies do not prevail. Well Mr. Napier I’d like to think that if I was behind an attempt on your life, at the very least I would’ve messed up your hair. So welcome, Boyd Crowder. Take your place among the noble ranks of the TBTS Movie Character Hall of Fame. Please try not to kill anybody or blow anything up. I’m really not qualified to be in on the discussion of Justified in its totality, as I haven’t watched it all since the first two episodes. Sounds like there have been many commendable things about the show as it’s progressed through several seasons. Cheers to anyone who enjoys it. But you must be credited with giving it the ol’ college try. And for pointing out unpleasant truths that few fans would even acknowledge. It really is a good show. Not Breaking Bad level, but it aspires to be. And that’s enough for me.